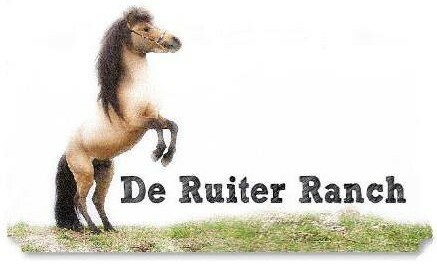 Welcome at "De Ruiter Ranch"
Welcome at the website from ‘De Ruiter Ranch’! My name is Maud de Ruiter and I have a great love for little horses. It all started 14 years ago (in 2001), when I got my first Shetland pony. I loved it, and it gave me the same pleasure as the big horses where I used to take care of; the walking, the biking, carriage rides, grooming and so on. My first Shetland pony, named Isabella, was in foal and Topie was born in 2002, a chestnut filly. That same year and the following year she was covered again and Ukkie and Wiesje were born. They got older and covered again and in a few years I had a huge ‘shetclub’, as I always call it. It became too expensive to have every year all mares covered at a stud farm, so I decided to buy a stallion. My first stallion was a beautiful chestnut tobiano named Turbo. After 3 years, he was replaced by Xam Framax, a brown first premium approved stallion. In 2009 I started to study the miniature horses and I liked them even more than the based-bred Shetland pony. I wanted to buy a luxury mare but my budget was insufficient at that time and I really had too much Shetland ponies. Last year I sold a few of them. At the moment I still have four (breeding) mares. All bred by myself so they are very special to me. In January 2014 Cezak suddenly crossed my path, I saw him on the internet and I immediately fell in love with him; a beautiful luxury bred miniature horse with very good bloodlines. He also had one of my favorite colors: Buckskin! Twelve January of that year he became mine. Now there was a miniature stallion I decided there must come a mare as well. I went to several breeders and suddenly Butterfly came on my path. A gorgeous small silverbay mare in foal for the next spring. I was in love from the first side I saw her and 27 december 2015 I bought her. Now I have my own small ‘horse ranch’. Every year I try to breed some nice horses with an honest character, correct exterior, good paces and hopefully good looking. I’ve studied the theory of color in horses; I prefer to have some of each color. Have fun on my site and for questions don’t hesitate to contact me! Most of the photos on my site are taken by Margje Braam Photography and may not be copied without permission.